BJP's reaction came after the Congress president questioned PM Narendra Modi's silence on China again blocking the UN resolution on Masood Azhar. New Delhi: The BJP on Thursday dubbed as “celebratory” Congress chief Rahul Gandhi’s remarks in which he attacked Prime Minister Narendra Modi saying he was “scared” of Chinese President Xi Jinping after Beijing blocked designation of JeM chief Masood Azhar as global terrorist. The party also asked why he had not made any comment when China had blocked the move on the same grounds in 2009 when the Manmohan Singh-led UPA government was in power. 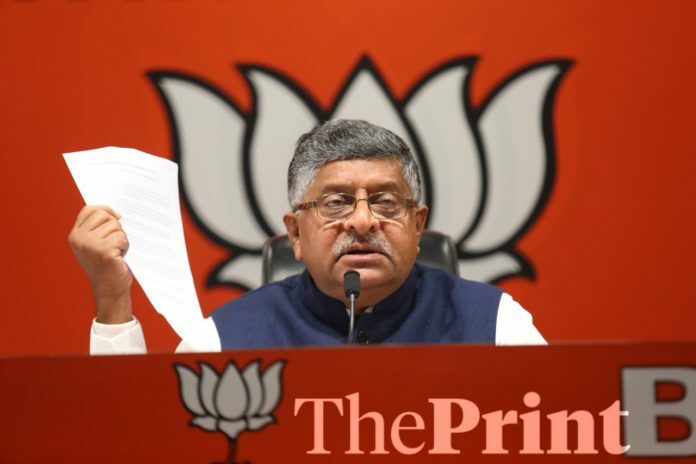 “Why is Rahul Gandhi in a celebratory mood when the country stands pained with this attitude of China,” BJP leader and Union minister Ravi Shankar Prasad told a press conference, claiming that Gandhi with his comments is seen to be “in close proximity with Azhar Masood”. Prasad said India has tried to mend fences with China, an apparent reference to Modi’s outreach to the country, but it will remain steadfast in its fight against terrorism. He noted that the proposal to list Masood as a global terrorist for the first time was backed by three permanent members of the UN Security Council and co-sponsored by other members and claimed that it was a big “diplomatic victory” for India as it showed that the world stands with it on its fight against terrorism. This is the fourth time that such a move was made in the UN and blocked by China on “technical” grounds, he said, adding that similar moves were also made in 2009, 2016 and 2017. Rahul Gandhi’s tweets must be “headline news” in Pakistan be circulated in JeM office with much merry, Prasad said, adding that it will perhaps make him happy. The Union minister said Gandhi had spoken about meeting Chinese ministers and that the Chinese embassy in India had wanted to see him off- permission for which was denied by the Indian government- when he flew for his Mansarovar pilgrimage last year. “If you enjoy such good relations with China, then you should have used your proximity to persuade the country to back the proposal in the UN,” he said, attacking Gandhi. Quoting from a book, Nehru- The invention of India, written by Congress MP Shashi Tharoor, Prasad said it has been written that India’s first prime minister played a role in China becoming a permanent member of the UN Security Council. India under Modi will continue to fight a decisive battle against terrorism, he asserted, adding that the BJP is “pained” if the Congress and Gandhi are happy with the Chinese action. “India and Indians are hurt with the Chinese decision,” he said. Foreign policies are not run from Twitter, the BJP leader said, targeting Gandhi over his response on the Masood Azhar issue. Thoughtful people have been urging over the past few years that national security / foreign policy should be beyond / above partisan politics, reflect bipartisan support and consensus. No raising of domestic political issues on foreign soil. Not belittling past national achievements and endeavours. Hopefully, that long standing convention will be restored, sooner rather than later. Ashok, indeed hope that we will have sanity restored very soon. I read your comments often and like the choice of your words. I wish our ministers and other politicians were also careful with the words they choose. It will, of course, be a great day for all of us, if the trolls could also become civilised.